I’ve finally reached the two hundred film mark! It’s been a long journey, but it’s so much fun and so rewarding. I’ve loved the journey so far, and can’t wait to continue it to its completion. If you’d like to get a sneak peek of what I watch and the ratings I give (plus exclusive short film reviews), follow me on Letterboxd! Definitely not one of the best Star Wars films out there, but still a hell of a lot of fun. This is the prequel to the TV series of the same name, basically acting as an extended pilot episode. I enjoyed Matt Lanter taking over the role of Anakin Skywalker, and the introduction of Ahsoka Tano (Ashley Eckstein) was thrilling. I especially loved learning about how Jabba the Hutt has an extremely adorable baby named Rotta, and the rescue mission Skywalker and Tano go on to return him to his father. The visuals look great, and I can’t wait to dive into the series. My only complaints with this film were the shaky vocal performances, the tone that can’t decide whether to be aimed at children or adults, and the sometimes strange pacing. 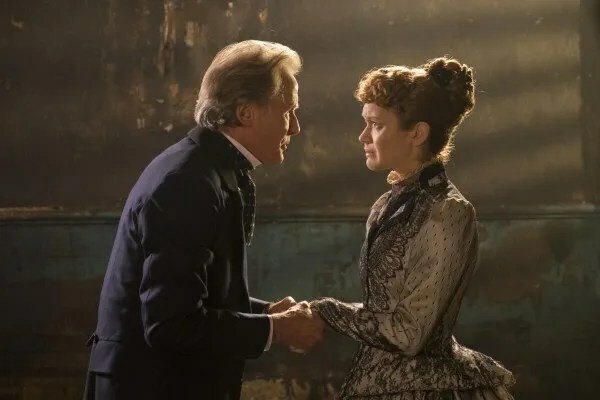 A thrilling mystery wrapped up in a visually stunning package and chock full of amazing performances, The Limehouse Golem is an underrated gem. Olivia Cooke stars as Lizzie Cree, a widow whose husband’s murder is blamed on the Limehouse Golem, a mysterious, dark creature. Bill Nighy plays John Kildare, the detective who is determined to find the true culprit. Douglas Booth gives an incredible supporting performance, and the aesthetic, costume design, and lighting are sumptuous. The story is gripping and took me by surprise, and I enjoyed trying to solve the incredibly macabre mystery. The pacing is the only thing that lets this film down (and the pacing is important in a film of this nature). Steven Soderbergh’s latest film is a powerfully compelling study on the human mind and features a tour de force performance from Claire Foy as Sawyer Valentini. Shot entirely on iPhone 7’s, Unsane feels gritty and voyeuristic, and the mystery is gripping. Sawyer is an unreliable narrator, and this aspect adds to the compelling nature of the film. Supporting performances from Jay Pharaoh, Juno Temple, and Joshua Leonard add twisted layers to an already complex, contained story. A must-see. What a delightful treat of a movie this is. Greg Berlanti (the mastermind behind the CW DC universe) directs Love, Simon in a realistic, yet simultaneously hopeful, way, while Nick Robinson is endlessly charming as the titular character. Katherine Langford, Josh Duhamel, Jennifer Garner, Alexandra Shipp, and Keiynan Lonsdale give multi-layered, grounded performances, and the emotional beats of the film are spot-on. Sure, some of the plot feels typical, but this is a feel-good movie about love and inclusion that is an important watch in today’s climate. I wanted to love this movie. Shailene Woodley gives a powerhouse performance as Tami Oldham, and Sam Claflin is charming as always as her fiance Richard Sharp. The fact that this film is based on an incredible true story makes it hit even harder, but it’s ultimately let down by the strange decision to have the story told in a non-linear fashion. It removes almost all mystery from the story, and sometimes takes away from some of the most powerful moments. I feel this would have been a much stronger film if it had been told in a linear fashion. I still enjoyed it, but was left a little disappointed. I really wanted to love Curvature. I adore Lyndsy Fonseca, and seeing her with her real-life husband Noah Bean on screen is a treat if you’re a Nikita fan. Sadly, this is a terribly executed science-fiction film with weak, monotone performances from its talented stars (even Linda Hamilton gets short shrift). I adore films with the concept of time-travel, but Curvature sadly doesn’t manage to pull off it’s lofty premise. It has decent special effects, but that’s about all it has going for it. A harrowing film about the sexual assault of a young woman on her school’s grounds, Graduation is a tough watch. The story follows the aftermath of this horrific act, and how it not only impacts Eliza, but her family as well. It’s heartbreaking to watch her father brush it off as something less than it is, and to see Eliza spiral. The performances are great, and the bleak aesthetic fits the tone of the plot. I just wish the pacing of the film hadn’t been so languid. I felt it hindered the sucker punch of the story by drawing it out for too long. A fun, engaging action flick, Wanted has incredible action sequences and strong performances from James McAvoy, Morgan Freeman, and Angeline Jolie (plus a delightful turn from a pre-fame Chris Pratt). The curving bullet aspect has become the touchstone of this movie, but I loved the knotty story and how McAvoy’s character goes from being a typical citizen working an office job and popping medication to a badass assassin. Sure, some of the plot aspects are far-fetched and predictable, but this is one hell of a ride. I know, I know, I should have watched this incredible work of art ages ago. This is widely considered to be one of the best (and most devastating) pieces of cinema ever created, and I have to agree with this statement. Schindler’s List tore my heart out and emptied my body of tears. Liam Neeson and Ralph Fiennes are incredible, and the stark black-and-white visuals add to emotional impact. This is a tough, albeit important, watch that deserves its revered status. Danny Boyle’s take on the zombie genre is a complex, thrilling film that unfortunately sags in the middle. The beginning and ending are gripping and harrowing, but the second act takes away from the urgent nature of the plot. Cillian Murphy is absolutely brilliant in this role, and I loved the desolate, (mostly) bleak aesthetic. The infected are terrifying and add a scare factor to this post-apocalyptic tale. I only wish the whole film had a consistent tone.